FEP member 79mustangcobra has uploaded a fantastic find to YouTube: the 79 Ford Mustang sales training video distributed to dealerships via the Ford Video Network. There's a definite 70s NFL Films theme carried through the intros for each of the three segments which highlight the base model Mustang, the Ghia and the Cobra. It's also interesting to be reminded of the new vehicle market at the time of the Fox Mustang's introduction. The Mustang was pitched as competition for a pretty wide variety of vehicles. You'll see the Monza and the Celica GT put up against the base model, the Ghia compared to the Camaro Berlinetta, and the Cobra versus the likes of cars from Porsche, the 280Z, Trans Am and Corvette. The 1979 Mustang lineup was nothing if not versatile. So, check out these videos (it's a two-parter) and head back to the times when rack and pinion steering was a huge selling point, TRX tires were low-profile and digs were being made at larger engines due to a recent fuel crunch. While V8s may get the bulk of the attention in the Fox world, FourEyedPride has always made a point of supporting all the power plants Ford installed in the Early Fox cars. To that end, we will continue to work on acquiring factory literature covering the various four- and six-cylinder engines, as well as the ever-evolving V8 engines the Early Fox era saw (no, we haven't forgotten the 4.2L). 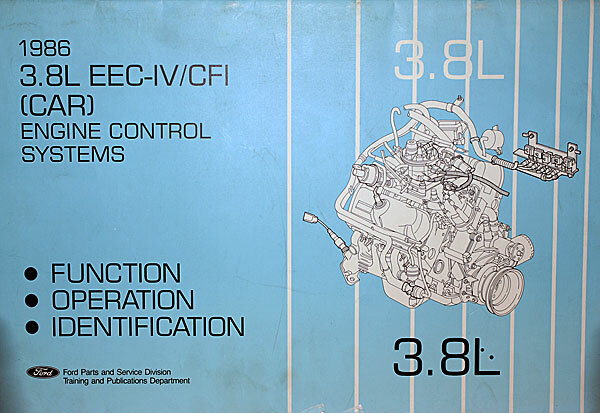 This PDF was made from an oversized training manual supplied to Ford techs to inform them of the features and testing procedures relating to the 1986 3.8L EEC-IV/CFI V6 engine. It includes schematics, operating condition definitions and more. To download this manual, please right-click, and choose Save As here. In 1979, the “New Breed” of Mustang was big news. European styling and handling characteristics had been paired with an American legend. Ford capitalized on the renewed interest in the Mustang brand by having the 1979 Mustang pace the Indianapolis 500 that year. The factory Pace Car replicas that were born from this exhibition are still among the most popular and well-known Foxes some 35 years later. An article that has just been added to our collection goes over in great detail not the production Pace Car Mustangs, but the specific parts that went into the drivetrain build-up of the Roush-prepped cars tapped for actual race duty and some of the requirements these modifications satisfied. It's well known that the early 80s saw American auto manufacturers aiming not so much for one another, but rather wanting to be compared to the increasingly popular and more sophisticated European marques. Ford Motor Company's Euro-inspired campaigns began in the 70s with its attempts to bring over the Ford Capri, and was solidified by the launch of the Fox platform in 1978. This carried over to seemingly every new Fox-based model. The design of the all new 1984 Lincoln Mark VII was made not only with the traditional Lincoln buyer in mind, but with an eye on the likes of Mercedes.